Adina Luican-Mayer started as an assistant professor in the Physics Department at uOttawa in January 2016. She received her undergraduate degree from Jacobs University Bremen in Germany (2006) and her PhD in Physics from Rutgers University in the Unites States (2012). 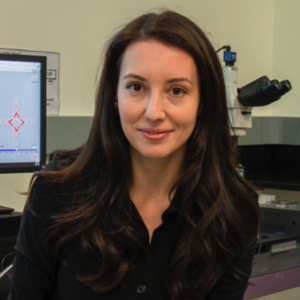 Previously to joining uOttawa, she was the Alexei Abrikosov postdoctoral fellow at the Center for Nanoscale Materials at Argonne National Laboratory in Chicago. Her research group focuses on uncovering the novel electronic properties of low-dimensional systems custom made by stacking atomically thin sheets of van der Waals materials using scanning probe microscopy and supporting spectroscopic techniques.